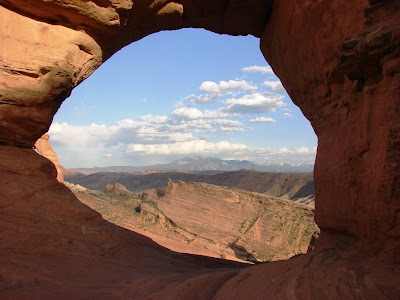 So, what do the Arches at Arches National Park, the Potash Mine just outside Canyonlands National Park, the tragic 2008 earthquake in the Sichuan Province of China, and the Southern Appalachians have in common? Well, ok, not much, but bear with me. In the last post on the geology of the Colorado Plateau, we were exploring the formation of a rather extensive mountain range in southwest Colorado, where the Rocky Mountains are today (but these mountains, the Ancestral Rockies, were eroded away in the late Paleozoic era). We were left wondering why mountains could be rising in the interior of the continent, when most mountain ranges seem to develop along continental margins. The breakup of the supercontinent Rodinia in late Proterozoic and Early Paleozoic time had a huge impact on the patterns of sedimentation in the Colorado Plateau, with a series of transgressions and regressions that gave rise to the formations of most of the recent posts. The continents remained as separate entities through much of Paleozoic time, but landmasses began to converge upon one another, and a series of collisions produced Himalayan-sized mountain ranges (which is coincidently the reason the Himalayas happened: Asia and India are colliding). A collision between a portion of Europe and the eastern part of North America raised the northern Appalachian Mountains. Asia and Europe connected to form the Ural Mountains, and in Pennsylvanian time, Africa crashed into the southeastern United States to raise the southern Appalachian Mountains. The supercontinent of Pangea was being constructed, bit by bit. The collision of Africa and the SE United States explains the Appalachians, but what about the tragic earthquake in the Sichuan Province? The Ancestral Rockies formed at about the same time as the Appalachians, but the two ranges are separated by a thousand miles or so. In the same way, the mountains of central China are far from the Himalayas, but their origin is related to the buckling of the crust related to this continental collision. The process of buckling produces earthquakes, and in highly populated regions this produces tragedy. Peripheral buckling of the crust along ancient fault lines related to the collision with Africa is at least one explanation for the origin of the Ancestral Rockies. The Potash Mine? Just south of the town of Moab, and on the edge of Canyonlands National Park, there is an exceedingly odd sight: the evaporation ponds of a potash mine. The turquoise blue, seen here from Dead Horse Point, clashes with the red beds of Permian formations. At the mine, holes are drilled into salt layers, and water is injected to dissolve the salts and bring them to the surface. The brine is evaporated, and the salts are harvested and transported away. The salt is also related to the formation of the Ancestral Rockies. When the crust is buckled and mountains rise, in other places the crust is pushed downwards. A feature called the Paradox Basin developed southwest of the Ancestral Rockies. It flooded with seawater, but for some reason the connection to the ocean was cut off, and the water evaporated, leaving behind thick deposits of salt and other evaporite minerals. Water flooded in again, and the cycle was repeated, at least two dozen times. Eventually the salt layers were thousands of feet thick. What is the connection to Arches National Park? Well, this post has become long, and I will discuss that issue next time! Where did all the dirt come from??? During the previous post, we discovered that something had caused thousands of square miles of land across Arizona, Utah, and Colorado to be inundated with mud and sand more than 1,000 feet deep. These rocks formed above sea level, as deltas, floodplains, river channels, and sand dunes. 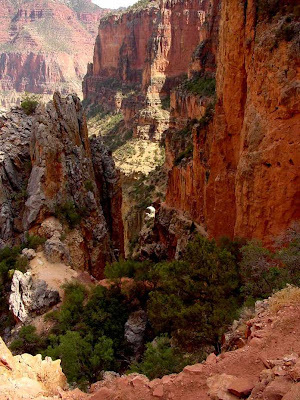 In the Grand Canyon, these layers of red sediments are called the Supai Group and Hermit Shale. In southern Colorado and Utah, related rocks are referred to as the Hermosa Group, the Halgaito Formation, the Cedar Mesa Sandstone, and the Organ Rock Formation (the Organ Rock Formation makes up the base of the spires of Monument Valley). On the other hand, today's photograph shows a canyon near the eastern edge of Colorado National Monument, one of those oft-overlooked gems that are scattered about the Colorado Plateau. The grayish scrub-covered rocks in the bottom of the canyon are composed of the same 1.7 billion year old metamorphic rocks that were seen in the Grand Canyon and Black Canyon of the Gunnison. Unlike the Grand Canyon, there is no Grand Canyon Supergroup, no Tonto Group, no Redwall Limestone, no Supai Group or Hermit Formation. None of the rocks of the Grand Canyon are found here at all. The rocks forming the canyon walls are Mesozoic in age (less than 245 million years old), with the lower slopes composed of Triassic Chinle Formation, and cliffs of Wingate Sandstone (more on these later). So we have a second mystery: why are the Paleozoic rocks missing in southwest Colorado when they are thousands of feet thick in adjacent regions? Pioneering geologists in the region soon recognized that the source of the sediments found in Arizona were mountains that had risen in southwest Colorado during Pennsylvanian and Permian time. The mountains were pushed so high that all the overlying Paleozoic sediments and a considerable amount of the Proterozoic metamorphic rocks were washed onto the coastal plains, leaving a denuded surface of metamorphic rocks that were not covered by sediments until Mesozoic time. These mountains are referred to today as the Ancestral Rocky Mountains or the Uncompahgre Uplift. As we look at the unconformity between the Proterozoic and Mesozoic rocks, we are looking at the eroded roots of what must have been an extraordinary mountain range rising from the interior of the North American continent. Which leads to the next vexing question: what were mountains doing within the continental interior? Mountains most often form along a continental margin (think of the Andes, Cascades, or Coast Ranges). For a long time, no particularly good explanation could be offered to explain the development of these mountains. More in the next post! And a salty surprise! Parts of the Grand Canyon are really red. Extremely red. So red, that a hike through the red layers leaves stains on socks that will never, never come out. So red that it spills over and turns the surface of the underlying rocks red too (see the last post about this). Red enough that the river that carries this sediment to the sea (or at least used to), the Colorado, means Red River. There are several red formations in the Grand Canyon, but the subject of today's post is a group of layers that are collectively known as the Supai Group and Hermit Formation. A group is a collection of formations that share some characteristic, such as similar rocks, age or depositional environment. There are four formations that make up the Supai Group, and they are a bunch of tongue-twisters: the Watahomigi, the Manakacha, the Wescogame, and the Esplanade. They are red. Did I mention that? All five formations are visible in the first photo. The lower prominent cliff is the Redwall Limestone, which takes the color by staining from the overlying Supai Group (it is actually gray). The Supai Group formations and the Hermit Formation are a series of alternating ledges and cliffs that are bright red, leading to another prominent cliff, the white Coconino Sandstone near the rim of the canyon. The individual formations are not easily distinguished. The easily eroded Hermit Formation is best seen in the second picture, where it is exposed just below the white cliff of Nankoweap Butte (as seen from Pt. Imperial on the North Rim). Collectively, these layers are the thickest of those seen from the rim of the canyon, totaling something like 1,000 feet. The first three formations date from the Pennsylvanian Period (just over 300 million years ago), and the Esplanade Sandstone and the Hermit Formation are early Permian (just less than 300 million years ago). What does the red mean? It means iron oxides, which form in the presence...of oxygen. Very few of the layers discussed so far in this series formed above sea level. The red beds formed in floodplains, river channels, delta deposits, and sand dunes, all above sea level. They are terrestrial deposits. So the Supai Group and the Hermit Formation cover thousands of square miles in northern Arizona to a depth of more than a thousand feet, which leaves us with a huge question...where did all this sand and mud come from? And why are Pennsylvanian and Permian deposits on other parts of the Colorado Plateau very different from those in the Grand Canyon? I do. But not in the normal sense of the word. I forget most things in my past, but those old memories are reawakened by looking at photographs taken at the time. The most vivid example came to me early in life, in my mid-twenties. 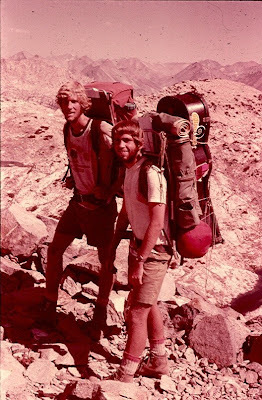 As a reward for actually graduating from high school, a friend and I walked the John Muir Trail along with some side trips during the summer of 1975 (and unfortunately a few short months before taking my first class in geology). Five or six years later, I decided that the trip, which I consider one of the pivotal events of my life, should be preserved as a written memory. As I started to describe the trip, I realized that huge gaps existed in my memories, and since I had only five rolls of Instamatic film (remember those cameras, older people? ), I was only taking two or three pictures a day. But those pictures were the key to my unlocking the memories. I only wish I could have taken more. So much has been lost. As such, I came across an older post on saving older pre-digital age photographs by Dr. Jerque at Geologic Froth that deserves your attention. I have thousands of old slides that I never have the time to peruse, and the good doctor makes that point that it is a lot easier to look at digital images than it is to pull up slides and run them through a projector or screen tray. Well, not exactly seeing red; it is more like seeing gray (I'll explain in a moment). The Redwall Limestone is one of the most prominent layers in the Grand Canyon, forming 400-500 foot cliffs almost anywhere that it is exposed (and in the Grand Canyon, that would be everywhere). It exerts a huge control on human access to the inner gorge of the park; literally all trails are located on the basis of how they can surmount or circumvent the Redwall cliffs (usually where a fault or joint system cuts through the layer). The Redwall Limestone formed in Mississippian time, around 330-340 million years ago. The lime formed in a shallow equatorial environment. Rocks like it are found all across North America, the result of the spread of one of the greatest of the Paleozoic epicontinental seas. Fossils are extremely common, including brachiopods, bryozoans, corals, sponges, nautiloids, and fish. The rock is generally gray in color; the characteristic red color comes from seepage of iron oxides from the overlying Supai Group. 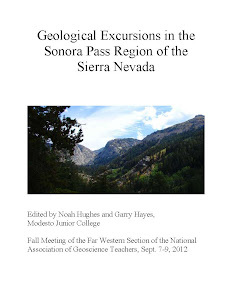 As I have noted in previous blogs, I became a geology major largely as a result of a 1976 field trip into the canyon. The Redwall Limestone loomed large on that journey. Really steep and TALL! Water sources were widely separated, and we loaded up more than a gallon apiece at a spring at the base of the Redwall, since we would have none for the remainder of our journey out of the canyon. The climb up the cliff was tough, but along the way we explored a copper mine (my first time seeing azurite and malachite), and once we made it to the top of Horseshoe Mesa, we explored a pair of limestone caverns (complete with ropes and helmets that we had dragged during the entire journey). The caverns were another geological revelation to me. Who knew there are hundreds and hundreds of caves in the Grand Canyon (besides a number of geologists and spelunkers)? But there are! Even in Mississippian time, sinkholes and caverns formed on the surface of the Redwall. The sinkholes filled with sediments from the overlying formation, and indeed an entire formation went unnoticed in these sinkholes right up until the 1980's (the wonderfully named Surprise Canyon Formation). The caves that are open to exploration today formed much more recently, when the groundwater table was higher, around the time that the canyon itself was being carved. Rather few of the caves are actually accessible to people on foot. Most often, the caves open out as alcoves at the top of the Redwall cliffs, and are easily visible from most points on the rim. Some of the caves were accessible to Pleistocene mammals, and at least one of the caves was full of ground sloth droppings (a precious scientific resource that got burned up a few years ago). A final note, about caves. Publicity is the death knell of a cavern. I made it back to that cave on Horseshoe Mesa about 25 years later, and it was a mess, not much more than a featureless hole in the ground. It may be that I didn't get into the back reaches that I remembered, but every visit to a cave does damage, and this one has sustained a lot. Take care when in caves; they can't be fixed in our lifetimes. 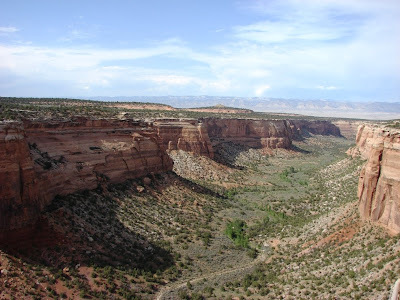 Time Beyond Imagining - A Brief History of the Colorado Plateau, Part 4: Something is Missing! Imagine that you are interviewing two candidates for a job opening. One of them has a perfect resume, with a complete job history going back for years, with no time periods for which a job was not being performed. The other candidate has a rather sloppy resume, and there are years at a time where no job is mentioned. It might be easy to choose whom you would hire, but on the other hand, who do you find the most interesting, the most mysterious? Who do you want to know more about, even if you would never hire him or her? Geology on the Colorado Plateau is much the same as a choppy resume. Each layer is a mere glimpse at a short period of earth history, but huge gaps exist between many of the layers. These gaps, mentioned in previous posts, are called uncomformities. They result when exposure produces erosion that removes previously existing rocks. There are at least 14 of these gaps in the Grand Canyon section. In the previous post, we talked about the Tonto Group, the three Cambrian-aged layers that were laid down sequentially as the shallow epicontinental sea covered much of the North American continent. These layers formed around 545-515 million years ago. If there were a complete unbroken record, the next layers would be Ordovician (490-445 million years ago, roughly) and the layers above those would be Silurian (around 445 to 415 million years ago). But they aren't there. Something like 100 million years has gone missing! The next layer in the sequence at Grand Canyon is the Devonian-aged Temple Butte Limestone. It is a fresh-water limestone that was deposited across a rough eroded surface. In many parts of the Grand Canyon, it doesn't even exist as a continuous layer, because it was eroded itself before the next formation was laid down on top of it. I have not actually seen it myself in my travels inside the canyon (and certainly no digital images, thus a mysterious looking canyon sunset for a picture today!). The layer is of great interest because although vertebrates are known from middle to late Cambrian time, and they evolved widely in Ordovician and Silurian time, the Temple Butte Limestone is the first Grand Canyon formation that has fish fossils. They are the bony plates of fish who scuttled back and forth in the channels near the Devonian shoreline. Geology is interesting to me, not because the layers of the earth provide all the answers to all the geological mysteries, but because so much of the record is missing. A geologist has to be a very intuitive detective, working with limited information and tantalizing clues. But what a great journey! Time Beyond Imagining - A Brief History of the Colorado Plateau, Part 3: LIFE! Fossils! Do you remember that first moment that you found a fossil as a child? Or did you never have that experience? I vividly remember exploring a meadow on the Kaibab Plateau north of the Grand Canyon as a 10-year-old. I didn't know what they were at the time, but later learned that they were disks from crinoid stems and sponges from the Permian seas 300 million years ago. I was impressed; I was not even disappointed that they weren't dinosaurs. I can look back and see this moment as one of the seminal events that led to my choice of geology as a field of study. All kids go through a fossil phase. I also know that most geologists and paleontologists simply never outgrew it. And so it is that today's post is about fossils. Particularly the earliest complex life that evolved on our planet. 600 million years ago (give or take, what's a few million years between friends? ), the continents of the world were in the process of splitting and breaking up. Many laypeople have heard of Alfred Wegner's Pangea, but we are not talking about that particular supercontinent (although we will in a later post). The continent that existed around a billion years ago has been named Rodinia. Such continents seem to be unstable, perhaps due to the buildup of heat from underneath. The land is pushed upwards in vulnerable places, the continent splits, and new seas are formed. As the continents move further apart, they subside and the shorelines around the margins of the continent invade the land. All over the world, the seas were transgressing across continental surfaces, forming shallow epicontinental seas (I am guessing that Hudson Bay comes closest in today's world as an example). The split in North America cut across the southeastern part of California, and through central Nevada. 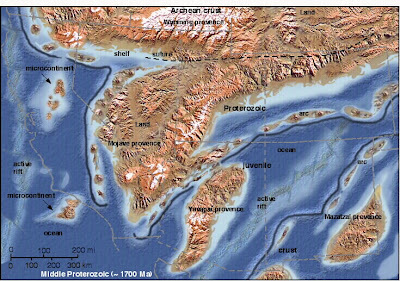 During the Cambrian Period, the transgressing seas covered most of the southwest, with the exception of a portion of Utah called the Transcontinental Arch. The region was located close to the equator, so the ingredients were there for life: nutrients, shallow water, warmth. Life was about to get a whole lot more complex than the single-celled organisms that had existed for billions of years. The details are for other experts to describe, but multi-celled life appeared, and thrived. Look at the picture of the Grand Canyon. Down in the depths there is a prominent terrace called the Tonto Platform. The platform exists because the Bright Angel Shale cannot form cliffs for very long, being easily eroded. Just below lies a cliff of Tapeats Sandstone, and above are a few slopes and ledges of the Muav Limestone. These three formations, sand, shale and limestone, record the invasion of the shallow sea across the Grand Canyon region. Pick up enough fragments of the Bright Angel Shale, and you may be lucky enough to find the signs of the explosion of life that swept across the planet around 540 to 500 million years ago. Worm trails and burrows are plentiful, but the prizes will be the discarded exoskeletons of trilobites. Trilobites are arthropods in the same phylum as the insects, crustaceans, arachnids and other jointed-legged creatures. Because they were one of the first animals to possess a hard shell, their fossils tend to dominate the fossil record, even though a large number of soft-bodied animals were doubtlessly around (see one of my first posts). They walked and burrowed in the sediments of the ocean floor; some grazed on algae, some were mud processors, some may have been predators. They ranged in length from a quarter inch to one monster that exceeded three feet in length. Their closest living relatives are probably the horseshoe crabs (see this NOVA geoblog article). Some were capable of rolling up like pill-bugs to protect themselves. They grew by molting, so not every discovery is a dead creature, simply a cast-off shell. Other early creatures included brachiopods, sponges, and strange cone-shaped archaeocyathids, which may have been distantly related to corals. It looks like the National Geographic Channel has put together a great documentary on Planet Earth, called Earth: The Biography. It is always good to see the planet getting the glossy treatment in a way that instructs and inspires at the same time. I enjoyed the BBC's Earth series a few months back even though it was mostly about animals and plants and stuff! Check it out! Look at a picture of one of the most famous geologic localities in the world, the Grand Canyon in Arizona: in this case, from the South Rim, in the vicinity of Desert View on the eastern edge of the park (we were on the North Rim during our recent trip, but this view works better for today's discussion). Sedimentary layers stacked thousands of feet deep, recording hundreds of millions of years of deposition in shallow seas, river floodplains, and desert dune fields. But take a closer look: there are two utterly separate stories revealed here. One story is told by the horizontal layers making up the upper walls of the canyon. Their story will be told on a different day. Concentrate instead on the tilted layers visible in the bottom of the canyon. 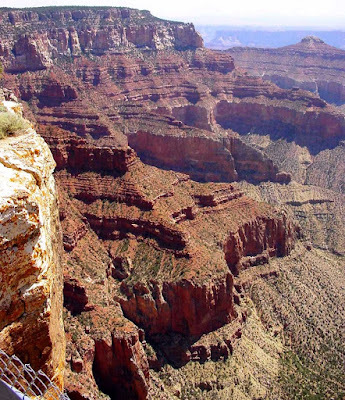 The upper layers of the Grand Canyon, the Paleozoic rocks, are about 4,000 feet thick. The tilted layers below, the Grand Canyon Supergroup, are closer to 12,000 feet thick, some three times thicker. How in the world did more than two miles of sedimentary layers get tucked into the bottom of the Grand Canyon, between the very ancient metamorphic rocks and the flat-lying Paleozoic rocks? The basic story is as follows. Following the formation of the Mazatzal/Yavapai mountains in early Proterozoic time, erosion reduced the mountains to a nearly flat, featureless plain (see my previous post on the Oldest Rocks). At various times the land subsided or sea level rose, leading to the deposition of thousands of feet of sedimentary rocks: sandstone, shale, limestone, and some occasional volcanic flows. 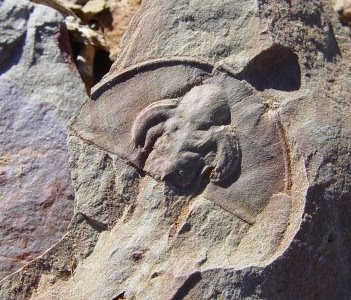 As in the older rocks, few fossils are found; life on the planet consisted mostly of single-celled organisms. Exposed land was barren of life. The southwest part of the continent was stretched about 700-800 million years ago by forces related to the break-up of the supercontinent Rodinia. The crust broke into a series of fault blocks that tilted the sedimentary rocks, and raised a series of mountain ridges that would have resembled the faulted mountains of central Nevada and eastern California (the Basin and Range Province). 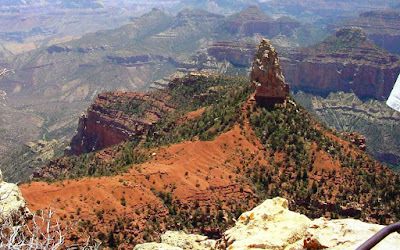 These mountains may have been thousands of feet high, but as in previous events, erosion brought the mountains down, and the layers of the Grand Canyon Supergroup disappeared across the region, except in a few places where downdropped blocks protected the sediments from erosion. Only a few ridges, a few hundred feet high, projected above the plains. This surface was later inundated by rising Paleozoic seas. So, much of the story of the Grand Canyon involves what is missing more than what is present. Some 500 million years elapsed between the Mazatzal mountains and the formation of the layers of the Grand Canyon Supergroup. Another 250 million years is missing before the deposition of the Paleozoic sequence. These gaps in the rock record, indicated by buried erosional surfaces and abrupt changes in the rock types (metamorphic topped by horizontal sediments; tilted sedimentary layers topped by horizontal sediments) are called unconformities. The two unconformities in the depths of the Grand Canyon are among the most famous in the world. I love these particular rocks...they are difficult to access, only by long steep trails, and I have only stood on them once. But it was my first extended geology field trip; a five day backpack down the New Hance Trail and up the Grandview Trail in 1976. I came out of the canyon convinced that I wanted to be a geologist. I was able to place my hand on the unconformities, I understood for the first time the idea of the earth's crust as a history book, I touched for the first time some of the oldest fossils on the continent. For icing on the cake, I even saw the Northern Lights for the first time in my life while we were camped on Horseshoe Mesa! What is next? 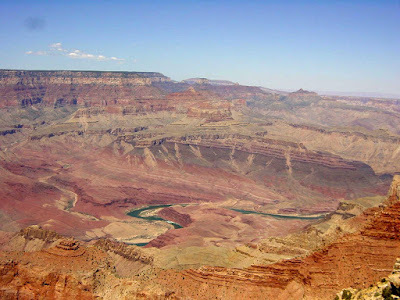 Life finds a way....the Paleozoic story of Grand Canyon and the Colorado Plateau! If you want a sneak peak at some of the sights from our recent Colorado Plateau journey, taken by an excellent photographer, check out http://www.mrhollister.com/getout/geology_trips/2008_Colorado_Plateau/index.html. Ryan has a great site for his high school students, including huge numbers of great photographs from all round the American west. And he performed wonderfully as a volunteer on our recent trip. Thanks for your able assistance! Looking at the oldest rocks of any region requires that we free ourselves of the present-day geography. In the case of the Colorado Plateau, the landscape that existed 1.7 billion years ago was very far removed from the relatively stable arrangement of horizontal sedimentary rocks and gently faulted and folded monoclines and upwarps that exist today. It was not at the same latitude and longitude, possibly not even in the same hemisphere. The land we now know as the Plateau was connected to a large landmass that today is Australia, Antarctica or Siberia. How could everything be so completely different? Amazingly enough, movements of 2-3 inches a year, added up over millions and billions of years, are more than enough to account for the huge changes we see in the rocks. Entire continents move laterally, collide, split up, and reconfigure the world's geography on a constant basis. The oldest rocks of the Colorado Plateau are much changed from their time of origin. The original sandstone, shale and volcanic rocks have been contorted by heat and pressure brought on by burial deep in the crust, as much as five miles or more. They may date from hundreds of millions of years before the time they became metamorphic, perhaps 2.0-2.2 billion years before the present time. Very little of the original textures can be detected in these metamorphic rocks. Still, we can make some reasonably accurate conjectures about how these rocks formed. 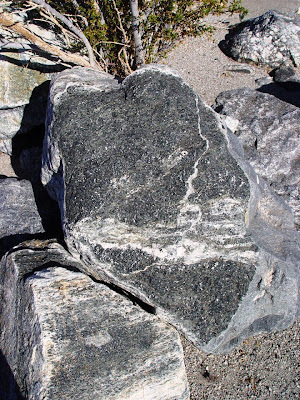 As a rule, the conditions that form schist or gneiss require a major mountain-building event, such as the collision of major continents (like India and Asia today), or by the collision of a terrane with the edge of a continent (such events have happened in Alaska and Indonesia). The best evidence, illustrated very nicely in the Blakey reconstructions linked below, shows a regional continental arrangement somewhat similar to the situation that exists today in southeast Asia. North America was a smaller continent, and only a small corner of California existed as dry land. Two island masses, the Yavapai and Mazatzal islands were moving north towards the continent. They made contact, one after the other, about 1,700 million years ago, causing an extensive mountain range to rise. The range extended through New Mexico, Arizona, California, and an unknown distance west. We can't say for sure how tall the mountains were, perhaps 10-20 thousand feet, but we can say that they were absolutely barren of life: only rock, gravel and maybe snow. Even in the seas, nothing above the level of single-celled life existed. The mountains rose to the sky, the mountains eroded. And eroded. Over several hundred million years, rock was removed until nothing remained but a nearly flat plain near sea level. Whatever else happened in this interval is lost to us forever, for erosion, by definition, removes information. But the roots of the mountains still exist for us to study, in the Inner Gorge of the Grand Canyon, at Frenchman's Mountain outside Las Vegas, in the Black Mountains of Death Valley, on the Uncompahgre Uplift in Colorado (and Unaweep Canyon), at Colorado National Monument and Black Canyon of the Gunnison National Park, and at other sites scattered in the deepest canyons on the Plateau and around the Basin and Range, especially in southern Arizona. The rocks, in my humble opinion, are some of the most beautiful one can find. The biotite and muscovite mica shines like glitter, the black and white layers form incredible folds and crinkles (crinkles, there's a geological term for you), and the occasionally there are the bright greens of epidote and the red-browns of garnet. It is humbling to hold rocks from a different time and place far changed from the world we know today. I would like to use a series of posts to illustrate the incredible story revealed in the rocks of the Colorado Plateau where I held class for the last two weeks. The Colorado River and her tributaries have laid bare a wide swath of the earth's crust, exposing more than two billion years of earth history. Few places offer so much information, exposed so vividly, within an area that can be toured over a matter of days. The principle of superposition tells us that in a sedimentary sequence, the oldest layers will be exposed deeper within the surface, presuming that no overturning has taken place. It is when we find the base rocks upon which the deepest sedimentary layers are laid that we find the truly ancient rocks. On the Colorado Plateau, this happens in a couple of places: the Inner Gorge of the Grand Canyon, at Colorado National Monument, and especially at Black Canyon of the Gunnison National Park. If you wish to pick up a few pieces of the ancient crust, you might check some of the quarries in Unaweep Canyon south of Grand Junction, Colorado and other locales on the Uncompahgre Highlands; collecting is generally allowed on Bureau of Land Management and National Forest lands. Black Canyon of the Gunnison is extraordinary. Over time, the deep crust in this region has been lifted and pushed upwards into mountain ranges thousands of feet high, in Proterozoic time, in late Paleozoic time, and now in Cenozoic time. Mountains rose, and mountains were eroded away. Eroded so completely that shallow seas washed over the remains of the mountains and covered them with hundreds and thousands of feet of additional sediment. Today, the Gunnison River is misplaced, in a sense. 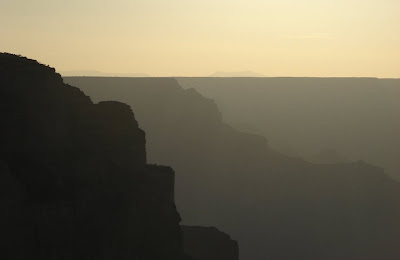 Standing on the rim, one is struck by the way the land slopes away from the canyon walls; the deep valley more or less crosses a mountain ridge. The formation of the present-day canyon, which at 2,000 feet is often deeper than it is wide, is an entire post in itself, to be saved for another time. I want to concentrate on the ancient rocks that form the canyon walls. The Proterozoic is what we call the time period from 2.5 billion years ago to about 545 million years. It is a vast expanse of time; all the story of complex multicelled life on planet Earth took place in the most recent 545 million years. The Proterozoic was four times as long! The rocks exposed in the canyon walls at Black Canyon are not sedimentary; they have been changed by heat and pressure into metamorphic rock: dark biotite mica schist, gneiss, and hornfels. 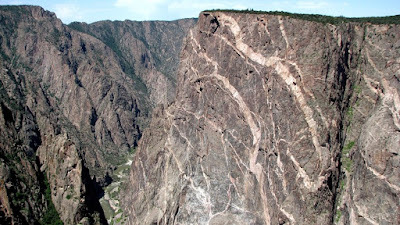 On the Painted Wall of Black Canyon, seen in the photo above, one can also see light colored dikes of granitic rock that melted and intruded into the older rocks about 1.4 billion years ago. The story of these most ancient rocks on the Plateau begins with tomorrow's post! Still decompressing after a "long" trip of two weeks through geologic time on the Colorado Plateau. It is always difficult to comprehend the contrast between the hours and days of one's human existence with the millions and billions of years that characterize the geologic history of our planet and Universe. I expect to follow this theme in my blogs for a few days as I sift through the pictures of our journey. 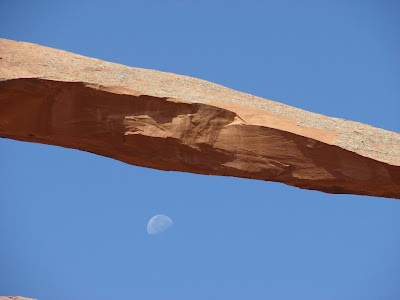 The unusual view above comes courtesy of astronomical lunar cycles and Landscape Arch in Arches National Park. The arch has an opening nearly as long as a football field, and is only 6 feet or so across at the thinnest point. It is rather a wonder that the span still stands, and the future prognosis of the arch is probably measureable in human, not geologic, terms. A large chunk fell from the span around 1991. The arches in the park are formed in the Slickrock Member of the Jurassic Entrada Sandstone. The unit has been pushed upwards by bodies of mobile salt from the late Paleozoic Paradox Basin. The upward pressure in the salt anticline has fractured and jointed the sandstone into a series of "fins", long narrow walls of rock. The base of the fins lie in the Dewey Bridge member of the Entrada (or Carmel), which is easily eroded, allowing a small window to form at the base of the fin. Chunks of rock fall from the window, until an arch develops. There are hundreds in the park.